Push Rules are defined per project so you can have different rules applied to different projects depends on your needs. Push Rules settings can be found at Project settings -> Push Rules page. If you are a subscriber and need a hook that is not there yet we would be glad to add it for free, please contact support to request one. every commit should reference a reference JIRA issue. For example: Refactored css. Fixes JIRA-123. Now when a user tries to push a commit like Bugfix - their push will be declined. And pushing commit with message like Bugfix according to JIRA-123 will be accepted. You can turn on a predefined blacklist of files which won't be allowed to be pushed to a repository. 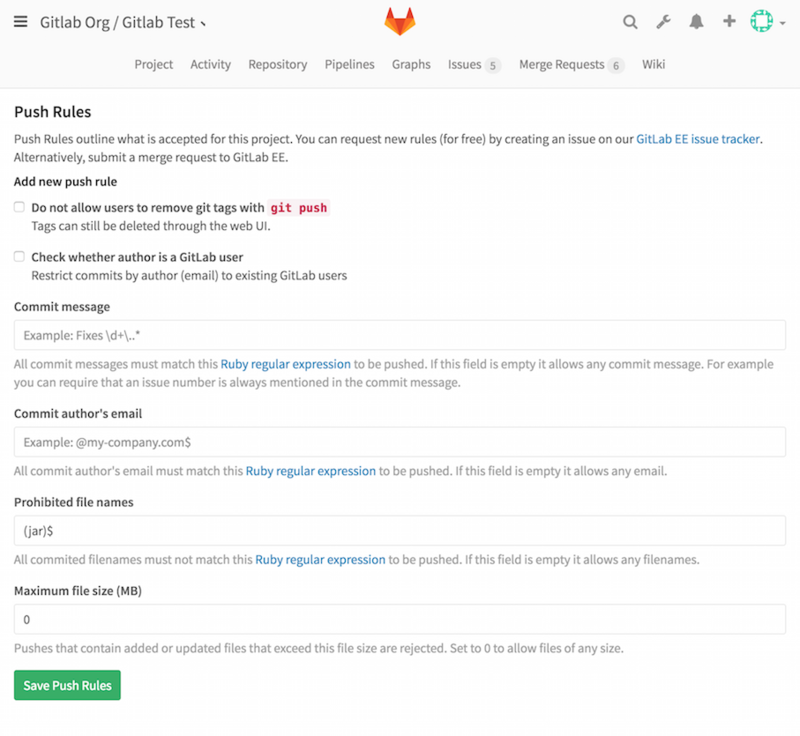 By selecting the checkbox Prevent committing secrets to Git, GitLab prevents pushes to the repository when a file matches a regular expression as read from lib/gitlab/checks/files_blacklist.yml (make sure you are at the right branch as your GitLab version when viewing this file).